Mix together flour, salt, pepper and paprika (I do this in a Ziploc bag). Dip chicken pieces in melted butter and then coat evenly with flour mixture. Place in a single layer on a greased shallow baking pan (skin side down – if you’ve left the skin on). Bake 400 degrees for 30 minutes. Turn chicken pieces over and continue baking an additional 30 minutes. 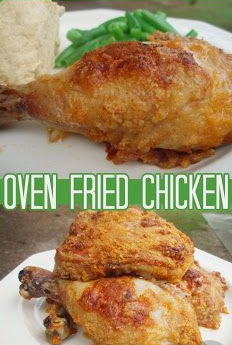 0 Response to "Oven Fried Chicken"